As students we learn something new every day at school. However, there are things we just can’t learn or experience by reading a textbook or listening to a lecture, this is where music comes in. On April 5th, at 2:30 am, the Dublin High School Irish Guard Band met up in the band room, got our bags on the bus, and made our way to the airport to fly out to Chicago. It’s safe to say most students couldn’t sleep the night before or on the plane, all that was on our minds was the fact that in just a few short hours we would be in Chicago, seeing the beautiful buildings and city lights for ourselves, the trip we have been preparing for this entire year. When we landed, we celebrated in the most logical way possible: with a slice or two of Chicago’s famous deep-dish pizza at Gino’s. After this amazing dinner with the entire band, we made our way over to the John Hancock Building to view the city from 94 stories up. With a 360 view of the entire city, it was hard to soak up the breathtaking image of the beautiful city lights. This was the trip we had all been waiting for, working hard for, for over a year, and there we were, we had finally made it. On the next day, we were able to explore more than just the area around our hotel. 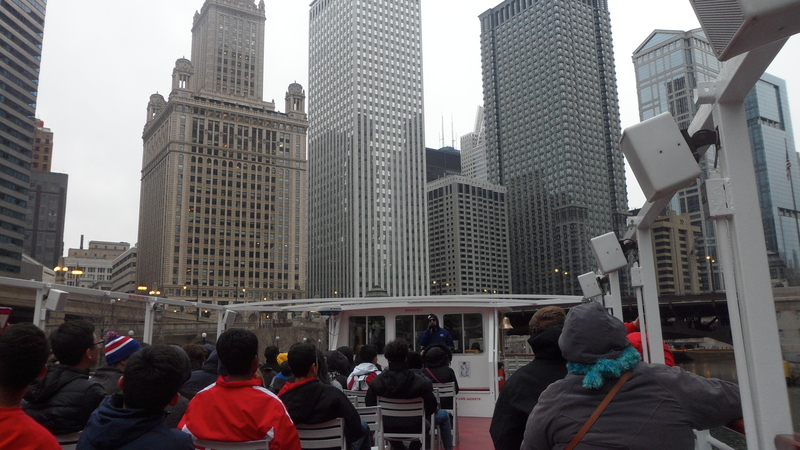 The day started with a coach tour of the Windy City and its musical history. We learned in detail about the jazz and blues musicians of the roaring twenties – a topic the Dublin High School AP US History students discussed just days before the trip. After the tour was the Cubs vs. Phillies game for the 100th Anniversary of Wrigley Field. The weather may have been cold but it didn’t bring our spirits down and this game was definitely a memorable one thanks to a surprise guest. The entire band got to meet Tom Ricketts the owner of the Chicago Cubs. The day ended with a dinner and a show at the Tommy Gunn’s Garage, we couldn’t have asked for a more perfect end to an exciting day. The food, comedy, and music were all fantastic and even the shy students couldn’t help but break out laughing with their peers. The students woke up on the third day knowing that this was the day of the first performance, we couldn’t help but feel anxious and excited at the same time. 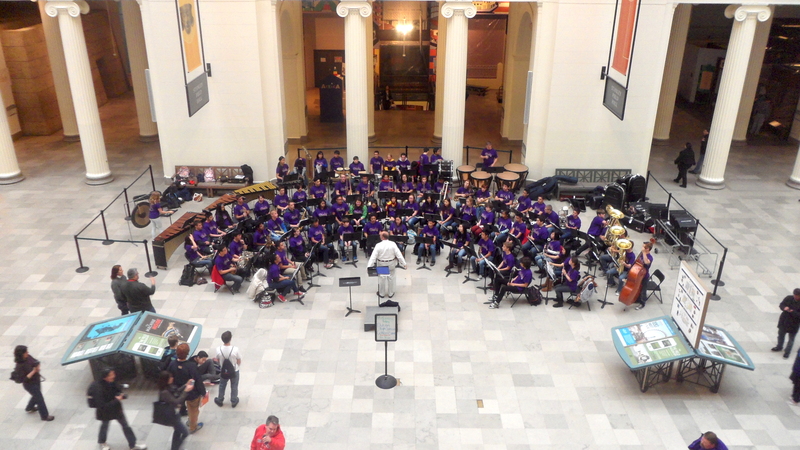 We arrived at the Field Museum and set up our instruments, ready to perform right next to Sue the T-Rex. Although we weren’t at the Symphony Hall yet, we were still in awe of the beautiful interior of the museum. After this performance was a group workshop with Mr. Roy and Mr. Mazzaferro at the Chicago Symphony Center. Stepping out onto that stage looking around the hall was an unforgettable experience, something I wish everyone could experience in their lifetime. After stepping on that stage for the first time and rehearsing, we made our way to the Navy Pier to go on the Architecture Cruise to learn more in depth about the history of the famous Windy City and the many buildings that make it up. Knowing our trip was coming to an end, we looked at the beautiful city lights and admired the architecture. Our final full day in Chicago was quieter and calmer than expected. We knew we’d be home the next day and the trip we’ve been preparing for and looking forward to for the entire year would be over and done with. The city was right in front of us, yet we couldn’t help but miss it already, we would have chosen to stay longer if we could. 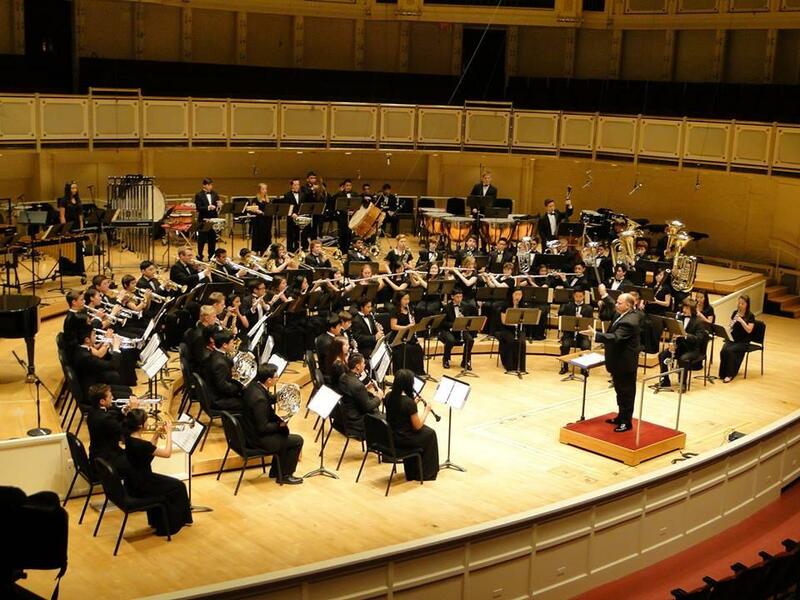 Later that day, we stepped onto the stage of the Chicago Symphony Hall for the second time, ready to perform. I can’t put into words the feeling of satisfaction and pride we felt when the audience applauded us, it’s something not every teenager can experience but we were the lucky ones. The performance was everything we wanted it to be and more and when the results came out, it was exactly what we wanted to hear. Gold. This entire year, I have never seen all the students so happy, at that moment I think we didn’t care if we were sitting next to some kid we barely talked to in class or our best friend. We were a group and we celebrated and cheered together. 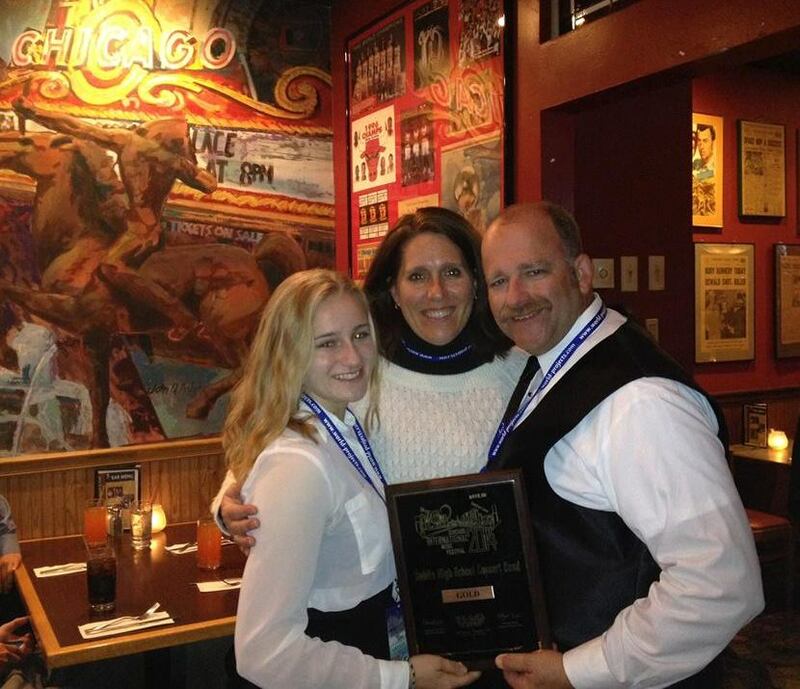 After this great news we were able to bond one last time by watching the Chicago Symphony Concert, meeting Melanie Kupchynsky a member of the Symphony, and one last dinner together as a group, in the city. We left for the trip at 2:30 am on April 5th knowing that we’d make memories to last a lifetime but we didn’t realize how precious these memories would be. Now we know that when we’re older, after college, with a job, and a family, we’ll look back to these few days and think to ourselves, “I wish I could go back”. This was one of the best experiences I’ve had in High School so far and I’ll never forget it.